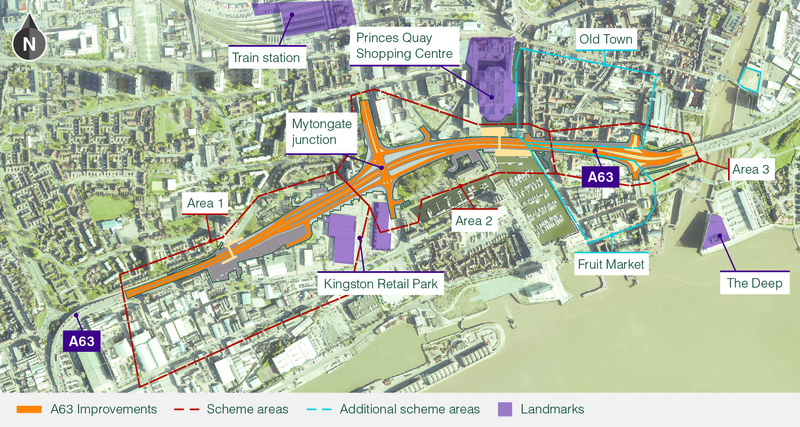 Proposals to improve a section of the A63 Castle Street in Hull. We consulted on the scheme in 2013 and January 2017 and since then we’ve been developing the scheme further. This includes completing additional environmental and traffic assessments, and refining the initial design in preparation for the development consent order application, which is similar to a planning application. Consultations with affected people will continue until the development consent order is submitted. The scheme boundary can be found under the media and documents section. Our development consent order application will include a consultation report, which will provide a summary of responses from all our consultations since 2013. These outline how your responses have been taken into considerations in refining the scheme design reports. Following the development consent order submission, a pre-examination stage will begin, when there is an opportunity for members of the public to register as an interested party via the Planning Inspectorate website and request to take part in the examination process. Mytongate junction restricts the flow of traffic along the A63, slowing journeys. This busy road has approximately 47,000 vehicles travelling along it each day. Delays at peak times cause problems for people and businesses. The A63 acts as a barrier between the city centre to the north and the retail and dock areas to the south. We need to create better connections between the two areas. We plan to create a new junction by lowering the level of the A63 at Mytongate junction. Ferensway and Commercial Road would cross the A63 creating a split-level junction. Between Princes Dock Street and Market Place we propose to widen the eastbound carriageway to three lanes. We have successfully completed archaeological investigations at Trinity burial ground. This work has been extremely important in helping us to plan for the construction of the Castle Street improvement scheme. The investigation has also provided a significant amount of historical information about the burial ground and Hull itself. To find out more, download our fact sheet. In March 2016 we started investigating parts of Hull’s medieval defences to understand more about the history of Hull and the people who lived here. Around 700 years ago, brick walls and ditches were built to protect the town from invaders, but these have since crumbled away or been removed. Our work aims to discover where the old walls were built. It also means that archaeologists can understand more about what they were made of and how they were constructed. Location : The A1033 westbound. Reason : Road repairs are planned. Status : Pending. Schedule : Expect disruption everyday between 20:00 and 06:00 from 1 May 2019 to 4 May 2019. Schedule : From 20:00 on 7 May 2019 to 06:00 on 8 May 2019. Lanes Closed : All lanes will be closed. Location : The A63 westbound. Reason : Road repairs are planned. Status : Pending. Schedule : Expect disruption everyday between 20:00 and 06:00 from 1 May 2019 to 4 May 2019. Schedule : From 20:00 on 7 May 2019 to 06:00 on 8 May 2019. Lanes Closed : All lanes will be closed. Location : The A63 eastbound between the A1165 and the junction with the A1033 East. Reason : Road repairs are planned. Status : Pending. Schedule : Expect disruption everyday between 20:00 and 06:00 from 1 May 2019 to 4 May 2019. Schedule : From 20:00 on 7 May 2019 to 06:00 on 8 May 2019. Lanes Closed : All lanes will be closed. Location : The A63 eastbound between the A1166 and the junction with the A1165 . Reason : Road repairs are planned. Status : Pending. Schedule : Expect disruption everyday between 20:00 and 06:00 from 1 May 2019 to 4 May 2019. Schedule : From 20:00 on 7 May 2019 to 06:00 on 8 May 2019. Lanes Closed : All lanes will be closed. Location : The A63 eastbound exit slip to the A1033 North. Reason : Road repairs are planned. Status : Pending. Schedule : Expect disruption everyday between 20:00 and 06:00 from 1 May 2019 to 4 May 2019. Schedule : From 20:00 on 7 May 2019 to 06:00 on 8 May 2019. Lanes Closed : All lanes will be closed. Location : The A63 westbound between the A1033 East and the junction with the A1165 . Reason : Road repairs are planned. Status : Pending. Schedule : Expect disruption everyday between 20:00 and 06:00 from 1 May 2019 to 4 May 2019. Schedule : From 20:00 on 7 May 2019 to 06:00 on 8 May 2019. Lanes Closed : All lanes will be closed.